You’ve been working diligently for the same employer, at the same job for years. You’ve given it your all. Countless hours of pain staking work. The job pays well. You have some great colleagues at work. And you have a benefits plan that you believe is fantastic. Part of that so called benefits package is disability insurance; which; in theory; you’ve been told will cover your wages if for whatever reason you can’t return to work on account of injury, illness or disability. You know little about the disability plan because you’ve never had to use it before and you’ve never missed out on work for a prolonged period of time. Your past work attendance has been excellent. Your performance reviews are always top notch. And then; things happen to change. Some really bad luck. A fall here that never quite heals. You throw out your back on account of a minor slip and fall. Or perhaps chronic pain starts to take over your body such that you can no longer focus, get out of bed or function like you used to. Or maybe you just aren’t the same person any more on account of psychological illness like anxiety, depression, sadness or a combination thereof. Perhaps you’ve been diagnosed with chronic pain or fibromyalgia. Whatever the reason, disability happens. Unfortunately, it’s a part of life for many. And when disability happens, you would hope that your long term disability insurer and employer are both there to support you when you need the help the most. After all, you’re the all star employee who has given it his/her all over the past 10+ years at work. Making the LTD claim is the first and most difficult step of the process. The paper work is NOT simple, nor is it quick/short. For some, simply getting the LTD claim forms from the employer or the insurer is difficult. They both know that you want the forms to go on disability. And for both employer and LTD insurer alike, this isn’t good news. We see employers and insurers who are sometimes slow or reluctant to get people the forms they need to make an LTD claim. There are forms which you, as the LTD claimant need to complete. There are forms your employer needs to complete. There are forms your doctor needs to complete. There are follow ups to the forms. Getting third parties to complete insurance forms can be like pulling teeth. Some doctors charge for the completion of forms. If you aren’t working, then getting the money to pay the doctor to complete the forms can be a challenge. The Long Term Disability claim package is NOT complete and fully submitted until all of the forms are complete. There are some cases in Ontario, where the forms get magically lost; thereby delaying and potentially defeating a claimant’s LTD case before it even has a chance to get off the ground. Our LTD lawyers see many such cases with claimants who suffer from psychological injury (depression, anxiety, suicidal ideation) and with our fibromyalgia clients. Once the claims forms have been submitted, there’s a strong likelihood that the LTD insurer will want you to sign some Releases so that they can gather your medical information. They may refer you to a rehab counsellor, or to your EAP program so that you can get some return to work assistance. They may even refer you or your medical records to an Insurance Medical Consultant so that a doctor retained by the insurance company can comment on your state of disability (in some cases, and all too frequently, they give medical opinions without even meeting with you and without a full medical record!). These sort of things happen all too often to LTD claimants. Lawyer up with a knowledgeable personal injury or disability lawyer. Somebody who is familiar with fighting against the heavy weight insurers in the LTD industry such as Great West Life, Manulife, SunLife, Industrial Alliance, Desjardins, RBC Insurance, Standard Life, Empire Life, Co-Operators Insurance, Equitable Life. You know the ones. Do NOT call the adjuster or write the adjuster to complain about their decision to deny your LTD claim. Again, by doing so you are playing right in to the insurance company’s hands. They record your phone conversations. If they aren’t recorded over the phone, then the adjuster on the other end of the phone is taking typed or handwritten notes of your phone conversation. Those notes will be used AGAINST YOU down the line to defeat your claim. And unless you’re taking notes of the same conversations, the insurer’s notes are not going to be favourable to your LTD claim, and will be seen as good evidence as the case progresses. You will say something you regret, or harmful to your case because of the emotions involved and you’re NOT A LAWYER. This isn’t the insurer’s first time doing this sort of thing. It’s not their first rodeo. They know what they want you to say. They know how to defeat your claim. It’s the exact opposite for the claimant. The imbalance of power and knowledge between a first time, injured, disabled, LTD claimant vs. a sophisticated insurer is remarkable. That’s why personal injury lawyers are there to protect your rights. Mind your words in your emails, phone calls and letters to the insurer. They will come back to haunt you. Want more tips from a lawyer in the know? 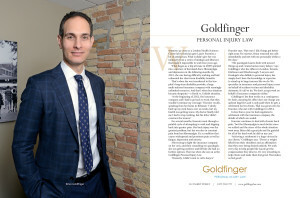 With offices in Toronto, London, Kitchener-Waterloo and Peterborough, Brian Goldfinger and the team at Goldfinger Injury Lawyers have the knowledge and resources to help you in your fight for Long Term Disability Benefits against the big insurance companies. 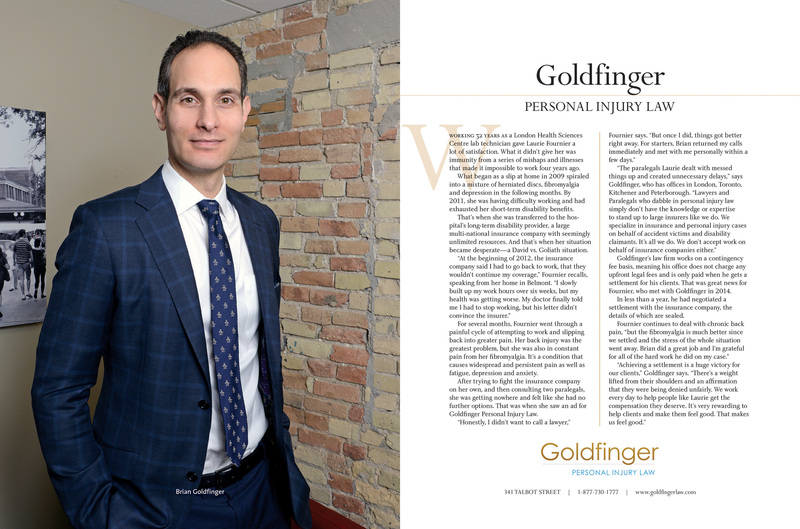 We represent clients across Ontario and you don’t have to pay any upfront legal fees. You only pay unless we win for you. No Win? No Legal Fees? It could not be any more simple. Reach out to us toll free at 1-877-730-1777 for more information.